Chances are you use Google Analytics or some other analytics platform to track your website's performance. But sometimes you need more information than what an analytics package can provide. It can be very helpful to ask website visitors one or two questions as they leave your site. 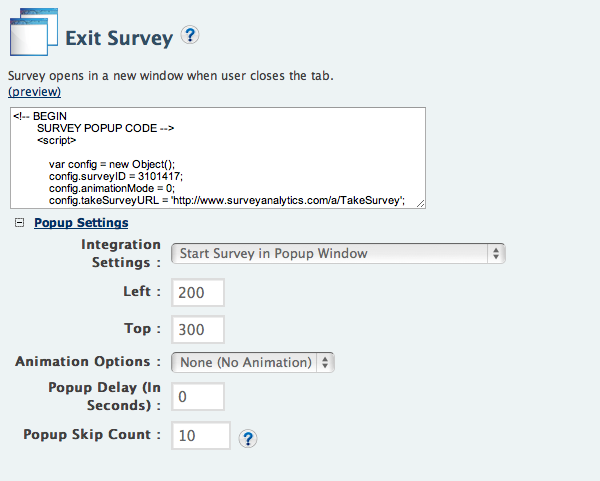 One of the many ways you can deploy a Survey Analytics questionnaire is as a website exit survey. When people click off your site they get a simple popup survey with which you can collect feedback on your website. Simply create your survey, click over to the Send Survey tab, click Website Intercept, then scroll down to Exit Survey. Here is a YouTube video walking you through this simple process. Also, here is a link to a Survey Analytics help file showing this process step-by-step.